Two children of my grandparents today – my uncles John Strachan and William Strachan – plus a half gg aunt who was possibly connected to the Strachan family in two ways. My half gg aunt Ellen Marshall, sometimes Helen, was born at David’s Lane, Kilmarnock, Ayrshire illegitimate daughter of my gg grandmother Sarah Marshall. a hand sewer. Sarah Marshall was a widow, having been married to John McInerney who died about 1850. Ellen’s father is not named on the birth certificate but Ellen has the surname in McDonald in the 1861 census, when she’s at 19 Fore Street, Kilmarnock with her grandmother Agnes Marshall, her mother Sarah and 5 siblings. In 1871 Ellen is at 26 Back Street, Kilmarnock with her mother and a cousin. She married Hamilton Kirkwood, an iron dresser, in Kilmarnock. Her occupation is given as bonnet knitter, and she said her father was Matthew Marshall, a deceased shoemaker – not such person existed, but she had an older half brother Matthew McInerney who was a shoemaker. In 1881 Helen Kirkwood is at Blair Terrace, Hurlford with a young daughter and a visitor: husband Hamilton was spending census night as a prisoner at Hurlford Constabulary Station – no idea what he did but there’s no trace of criminal proceedings so perhaps he got into a fight that night. In 1891 the family are at West Shaw Street, Kilmarnock with 6 children, and then they moved to near Glasgow as in 1901 they are at George Street, Partick. Hamilton Kirkwood is still an iron dresser and they have had 3 more children. In 1911 they are Whiteinch, Govan, where Hamilton is working as a shipbuilding labourer and they have 5 children still at home. She died in 1933 at Kilmun, which is in Argyll but is a small seaside resort which was on the route of the Clyde steamer and was popular with Glaswegians, so she may have been on holiday or staying at a convalescent home. Her usual residence was given as Medwyn Street, Whiteinch, Glasgow and the informant was her unmarried daughter Sarah who lived with her in Glasgow. Ellen/Helen may be connected to the Strachan family twice: her older half sister Mary Ann McInerney married John McCrae and their duaghter married Henry Strachan, plus the second wife of Robert Strachan, Henry Strachan’s grandfather, was Susan Cran, the illegitimate daughter of Jean Kirkwood, who may well have been related to Hamilton Kirkwood. My uncle Jock – actual name John McCrae Strachan – was born at Crookedholm, Kilmarnock, Ayrshire, third child of the grandparents I never met, coal miner Henry Strachan and Helen McCrae. John is in the 1901 census with his parents at Old Factory House, Crookedholm, and his father is a coal miner, the in about 1907 the family to moved to Lanarkshire, first to Tollcross and then to Halfway, Cambuslang. In 1911 the family are at 14 Mansion Street, and Henry and Helen now have 9 children: 12 year old John is still at school. John worked as a coal miner and married Sophia Jarvey Sweenie in 1921 at the Trinity United Free Church in Cambuslang: she was a local girl and was working at the pithead at the time of the marriage. They stayed in the Cambuslang area all their lives, and I can remember visiting them when I was a child. As far as I’m aware they didn’t have children but a family contact thinks they might have had a daughter called May. Can any Strachans out there confirm this? My uncle William McCrae Strachan, son of Henry Strachan and Helen McCrae was born in Cambuslang, Lanarkshire just before the 1911 census but I don’t know the exact date as I haven’t seen his birth certificate. He is with the family at Mansion Street, Cambuslang in the 1911 census but they moved shortly afterwards to 54 Gilbertfield Buildings, Cambuslang, which means Henry Strachan must have been working at the Gilbertfield Colliery owned by United Collieries Ltd. A report into miner’s housing in 1910 describes the Gilbertfield miners’ housing as two storey with each apartment of two large rooms plus use of communal toilets, washhouses, coal cellars and dustbins. Sadly, William died on 18 June 1912 at home, of measles and bronchio-pneumonia. Today is the 22nd anniversary of the death of my father Robert Strachan, known as Bob. I thought it would be good to remember him by posting some photos. My father was born in Cambuslang in 1916, the youngest child of Henry Strachan and Helen McCrae. Henry died three days before my father’s second birthday, so my father had no memory of him. 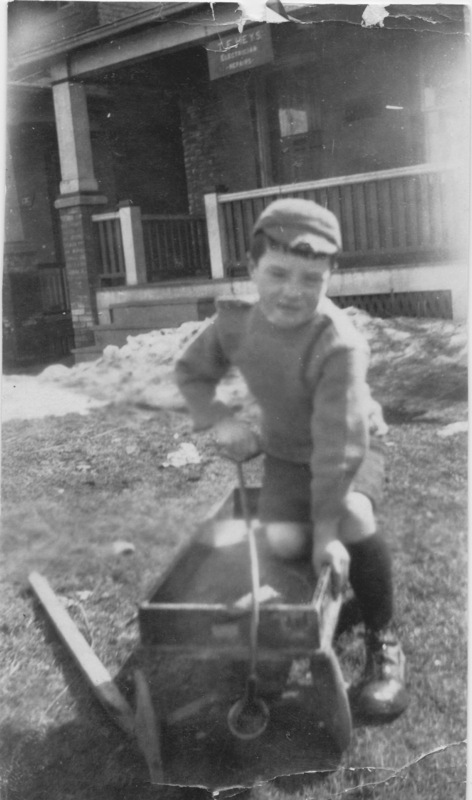 Several of his older brothers and siblings migrated to Canada in the 1920s, so young Robert went to and fro between Canada and Scotland with his mother a few times. 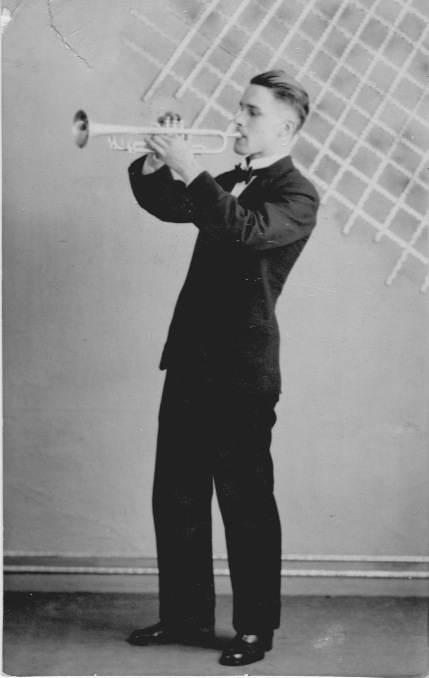 My father was a keen musician, played the trumpet and trombone, and had a good singing voice. He learnt to play courtesy of the Salvation Army in Cambuslang, was in a dance band and the army band during the war, and once settled in Leeds formed a band that played big band and jazz at dances and pubs in north Leeds, including the Kirkstall Working Men’s Club where my grandfather was president. Robert married his first wife just before the war, and almost immediately was called up into the army. By then he had begun a career in the construction industry. In the army, he was promoted to corporal and then sergeant, and became an ammunitions testing expert working at an underground depot near Corsham, Wiltshire. My big sister was born during the war, but her mother came down with tuberculosis and died when my sister was very young. He also played in the army band, and was in the Ralph Stacey dance band playing at forces dances in the south of England. They were even on the radio. Later on in the the war, Dorothy Fraser from Leeds, in the women’s army, was posted to Corsham and my parents met at an army dance. My mother was already a very good dancer but my father wasn’t, so she taught him and romance blossomed. They married in 1949 and settled in Leeds. My father continued to work in construction after the war, eventually becoming a project manager for buildings such as hospitals and shopping centres. He was always a proud father of both his daughters, as this picture shows. 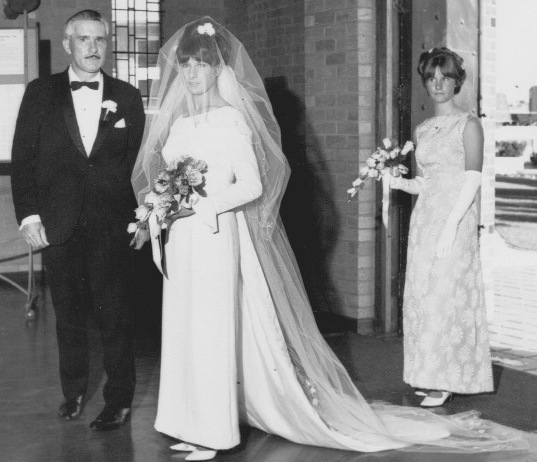 My sister’s wedding in the 1960s. That’s me as bridesmaid. You never stop missing your parents. This is a sad day for me, as it’s the third anniversary of the death of my mother. I miss her. Burial of James Wild age 25, husband of Ellen Oxley from Barnsley who was mentioned yesterday as she was born on 14 April 1839. So poor Ellen buried her husband the day after her 21st birthday, leaving her a widow with a one year old daughter. Baptism of Sarah Ann Wilson at Worsbrough, daughter of my ggg aunt Mary Green and her husband Joseph Wilson. Her parents lived at Stanley, near Wakefield, where they worked as gardener and keeper of Stanley Hall. Sarah Ann married James Burton and lived in Alverthorpe. John Strachan, third cousin twice removed, was born in Dreghorn, son of James Strachan and Mary Lindsay and great-grandson of my gggg uncle Robert Strachan. John was born in Dreghorn, became a miner, married Jemima Barrie and lived in Bannockburn, Stirlingshire and then back in Ayrshire. He and his wife and children migrated to New Jersey in 1923, and he worked as a porter at a bank. I know all this thanks to so many records now being online. Birth of my aunt, Helen McCrae Strachan, known to me as Aunt Nell. She was born in Crookedholm, Ayrshire but moved to Cambuslang, Lanarkshire with her family when she was very young. She married John Bain Aitken in 1923 in Cambuslang, and had two children. With her husband she ran the Cafe de Luxe on Main Street, Cambuslang which I remember visiting as a child. She was the best out of the whole of my father’s family for keeping in touch with everyone and loved visiting relatives. She sent me a McCrae tartan kilt when I was in my 20s and had moved to London, and it’s still in my wardrobe. Aunt Nell retired to Majorca with her daughter and died in Kent in 1999 at the grand old age of 93. Marriage of Ellen Devine, daughter of Susan Bell McCrae and her first husband John Boyle, and therefore niece of my grandmother Helen Strachan ms McCrae. Ellen married Hugh Davidson McKinnon in Glasgow and was the informant when her mother died, but beyond that I don’t know what happened to her. I have two old photos have puzzled me for a long time. The first one is of my father who was born in 1916 in Cambuslang, south of Glasgow. No date on the back but he looks to be around 5 or 6, so it must have been taken in about 1922. Unfortunately there is a tear over where the name of an electrician is, but looks like T. E. HEYS or T. E. KEYS. There’s this, taken outside the same building, and from the women’s dress and hairstyles I’d say it’s 1920s too. No names on it, but the woman centre front is my grandmother Helen Strachan ms McCrae. I think the young woman to my grandmother’s right is Sophia Strachan nee Sweeney who married my Uncle John in 1921, and the young woman to my grandmother’s left could be my Aunt Mary, who was Mary McBride by then. The woman on the far right is on some other photos taken in the 1930s and I think she’s my grandmother sister. I’ve no idea who anyone else is, but I don’t think the young boys include my father. So it’s another mysterious group family photo! Don’t you just wish someone had thought to write everyone’s names on the backs of them? A big day on my family tree – my grandfather Henry Strachan was born. Sadly, I know nothing about him apart from what I’ve been able to research, nor do I have any photos, as not only did he die before I was born but he died 3 days before my father’s second birthday so my father had no memories of him to pass on. Henry was a coal miner, born at Crookedholm, the eighth child of coal miner Joseph Strachan and Jeannie Haddow. He’s Henry in all the records but my father always said his name was actually Hendry. He was named after his uncle, the brother of his father, who did manage to get himself listed as Hendry in one census. Fortunately, as Henry he’s fairly well documented in the records. In 1881 he’s an 8 year old living with his parents and siblings in Crookedholm, and he’s still there, with his parents at Lamont’s Land, Crookedholm, in 1891, a 19 year old coal miner. His older brother Robert had died the year before and, sadly, his older sister Flora was to die two years later. Henry met local girl Helen McCrae, who lived in Hurlford and was the daughter of a coal miner, and she gave birth to their first child in September 1895. No marriage took place at the time, but that might have had something to do with the health of Henry’s father, who died in December 1895 of cardiac disease. But Henry Strachan and Helen McCrae did get married in March 1896, at the Commercial Inn at Hurlford, and they went on to have a total of 11 children, my father being the youngest. In the 1901 census they were living at Old Factory House, Crookedholm, with three children. In 1905 the Valuation Roll has, at Cowan’s Row, Crookedholm, Henry Strachan collier living next door to Henry Strachan pitheadman. This is my grandfather and his uncle but I don’t know which is which, though it’s more likely that the older Henry is the pitheadman as it was a job that usually went to older miners. They were both living in housing rented by Portland Colliery. Some time between 1906 and 1908 the family moved to Lanarkshire, to an area that is now classed as Glasgow. They first settled at Tollcross, where their next child was born. Henry’s younger brother also moved to Tollcross and there were a number of other relations already in the area. No doubt the main reason for the move was better or more secure work in the coal mines. Then they moved to Cambuslang, but times must have been tough as in the 1911 census the family is in a two roomed tenement at 14 Mansion Street in a household comprising Henry and Helen, 9 children aged from 15 to 2 months, and two lodgers, both coal miners. A very crowded household indeed! In 1912 Helen and Henry’s youngest child, William, died at the age 1 of measles and broncho-pneumonia. This must have been what prompted Henry to take out a title on a plot at Westburn Cemetery: I have the original title deed in my possession because my father ended up with it. Henry and family had moved by then and were living at 54 Gilbertfield Buildings. The address suggests Henry was working at the Gilbertfield Mine near Cambuslang, owned by United Collieries and which in 1910 employed 315 underground and 82 above ground. The mine owners’ houses for employees are described in a 1910 report as two storey, erected in 1884, with large rooms, wc in a close, and an inside sink with water. In the 1915 Valuation Roll Henry Strachan miner is the tenant of 54 Gilbertfield Buildings, Overton Street, owned by United Collieries, and paying a yearly rent of £9 12s. Henry Strachan died on 27 November 1918 at the age of 45, of pneumonia arteriosclerosis – a common cause of premature death in coal miners. He left behind a widow and 10 children, 5 of whom had not yet reached working age. There have always been differences in the marriage laws for Scotland and England. One difference was that, in Scotland, it only mattered that you were married by an authorised person, which for most people meant a man of the cloth. It didn’t matter where you got married. Hence the vast majority of Scottish marriages did not take place in the church (kirk), although the banns were read out at services. People in Scotland could therefore get married anywhere providing the minister agreed to attend. Up until around 1900 this usually meant the home of one of the couple’s parents, but from the end of the 19th century all sorts of places were chosen as wedding venues. I have Scottish ancestors getting married at hotels, the minister’s house (the manse) and various local meeting rooms or community halls. But from 1899 to 1920, three of the children of my gg grandfather Alexander Fraser were married at the Station Buffet, Ellon, Aberdeenshire. To me, a station buffet means a cafe next to the ticket office and the platforms, so I can’t help imagining a wedding going on while travellers queue for cups of tea and wait outside for their train. I don’t suppose that’s what happened, though. The station at Ellon is no longer there but the Station Hotel remains. Perhaps the Station Buffet was a room at the hotel next to the station. Alexander Fraser had 15 children, two from his first wife and 13 with his second, so there were lots of weddings in that family and his children married in a variety of places. The eldest were traditional and married at Mosside, the family croft. One married in the church at Old Deer, and three were married in Aberdeenshire but as I’ve not yet looked at their marriage certificates I only know the parish, not the actual location. 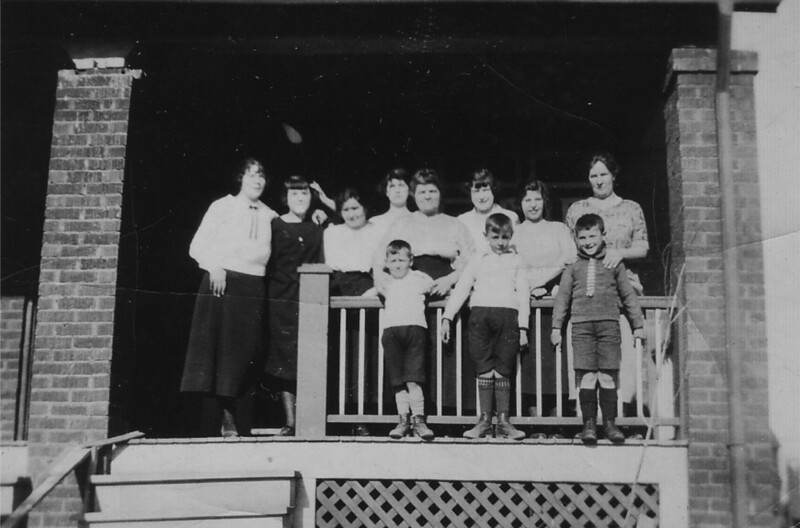 But a few of the younger children migrated to Canada and were married in Winnipeg. Going back a generation, to William Fraser’s children, one was married at the Cruden Toll Bar, one at Cruden Parish School, one at the Manse at Ellon, and one splashed out and married at the Waverley Hotel in Aberdeen despite the fact neither he nor his bride lived in Aberdeen. 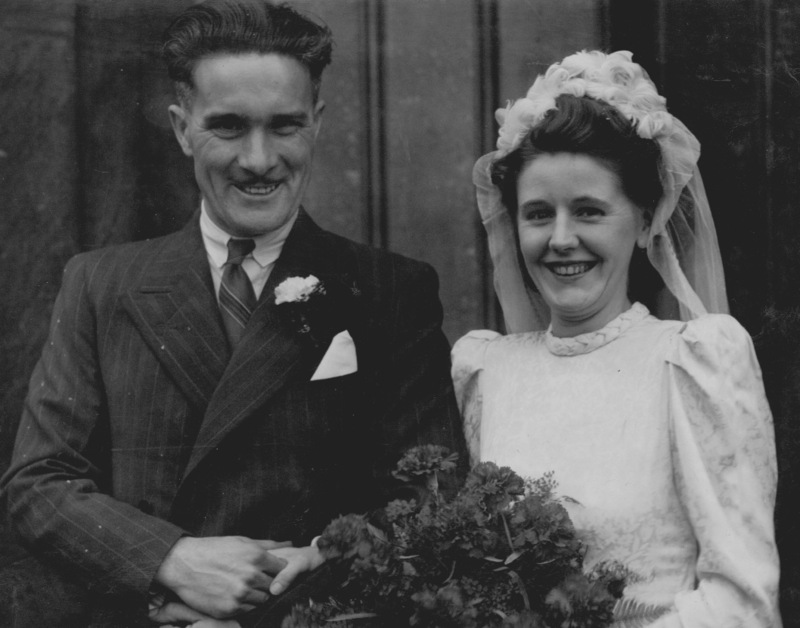 Over at the other side of Scotland, there were Strachan marriages at the Commercial Inn at Hurlford, Back Road Hall at Dailly and the Co-operative Hall in Cambuslang. I’m aware that many people think their ancestors would have got married in a church. But if your ancestors were Scottish that would have been highly unlikely. This is a photo of the grandmother I never met, as she died before I was born. 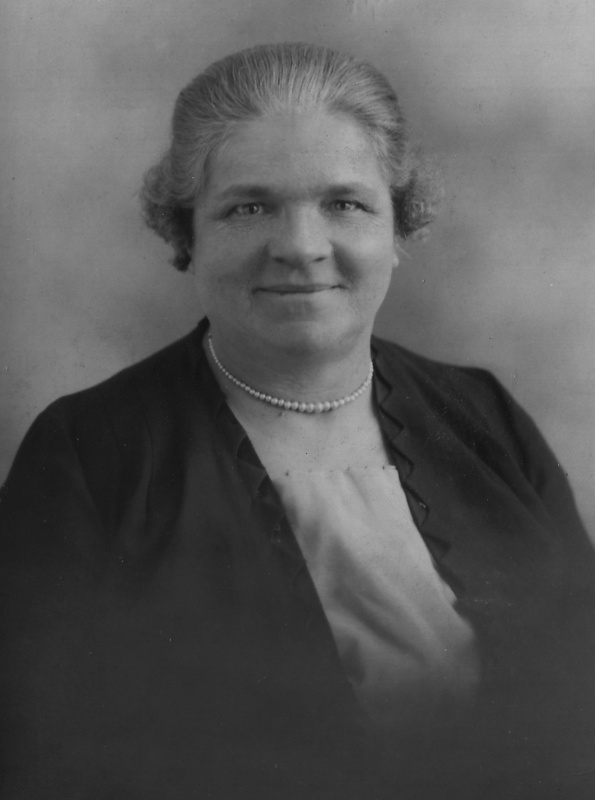 Helen McCrae was born in Kilmarnock in 1875, the daughter of John McCrae coal miner and Mary Ann McInerney. She married Henry Strachan in 1896 at the Commercial Inn, Hurlford and they lived in Crookedholm where their eldest seven children were born. They then moved to Lanarkshire, first to Tollcross and then settling in Cambuslang, where their youngest four children were born. One of Helen’s children died in childhood, of measles, but the remaining ten lived long and fruitful lives (or at least most of them did). Three of the children migrated to Toronto, Canada, and Helen and her youngest child, my father Robert, did several journeys to Canada and back during the 20s and 30s. Helen died in hospital in 1944. She was visiting someone, but sadly had a cerebral haemourage whilst there. 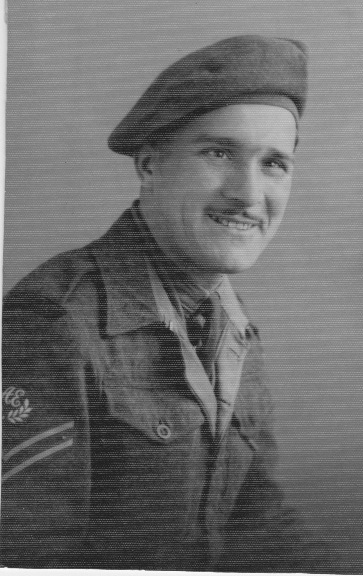 My father was in the army at the time, down near Bath. From what I’ve been told, Helen had a hard life, could be very tough at times, but was a bit of a softie at heart. I think it shows in her face in this photo.